Helen Reinherz's "kids" - all 400 of them - started kindergarten in 1977. They weren't her biological children, of course, but she has spent the last 30 years rooting for them as if they were. As the head of one of the longest-running mental health projects in the country, the Simmons Longitudinal Study, she has used her kids to compile a repository of important statistics on human emotional development. But Reinherz, who is 84 with a regal bearing, has never let her position as a research scientist overshadow her natural empathy as a human. When she began the project, studying the entire 1977 kindergarten class in the Quincy public schools (there were 700 at first, though she lost 200 almost immediately to parochial schools and another 100 from natural attrition), she thought she might stay with them through the third grade and focus on their early childhood development. But she grew attached to them and has continued to pop back into their lives every few years. As her kids entered their tumultuous teen years, she began to see signs for concern, such as the fact that 20 percent had thought about suicide. And so she did what she felt she had to do: If her kids needed help, she helped them get it (though she was always confidential, so as not to violate their trust). In some ways, this sounds counterintuitive for a social researcher; the implication being that she is tainting her own sample. She sees it another way. "I would be violating my own oath if I allowed people to destroy themselves," says the sassy octogenarian. Which is why, as the longitudinal study enters its fourth decade, Reinherz has turned her attention toward the factors that can turn a high-risk youth into a happy adult. Statistically speaking, many - but not all - of the children who showed early signs of trouble have been found to be less mentally healthy than those who did not. "We want to look at how those who were miserable at 15 are flourishing at 30," Reinherz said from her top-floor office in the Simmons College School of Social Work. "Was it something that happened, a relationship, a skill that came into play as they got older, family support? Only longitudinal studies can look at prior factors." Identifying children in crisis and working to tilt their trajectory has defined Reinherz's career. 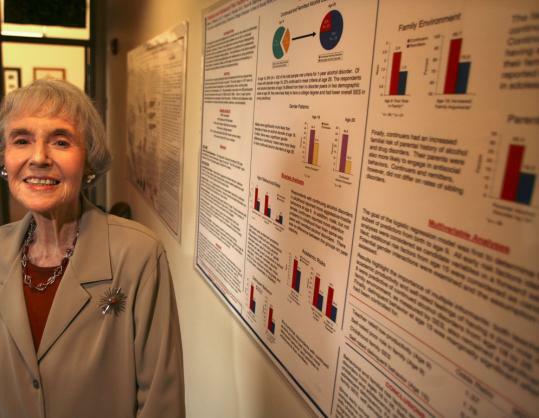 In the late '50s, she worked as a social worker and oversaw a program that brought student mentors in from Harvard and Radcliffe to work with adolescents at a state mental hospital who were suffering from serious mental health problems. "We got the patients the professionals didn't want," she remembered," and yet they seemed to flourish under the attention of the students." In the '60s, she studied the emotional impact of academic failure on students who had been kept back, which allowed her to form a close bond with the Quincy schools that led, ultimately to the longitudinal study. Rose Giaconia, who has worked with Reinherz on the research since 1990, said that what always impresses her about Reinherz is the desire to find the positive - which she said is rare in academia. "If we analyze data and find something positive, she's very excited," Giaconia said. "We're trying to predict which individuals will have problems, but she always has a goal toward practical applications, things they can do to improve their situation. And that compassion is infectious." Reinherz sends out newsletters to participants with study results and information on where they can go to get help. That, and her genuine interest in her subjects has kept their involvement constant over the years, Giaconia said, despite psychological interviews that can be stressful and last up to three hours each. "In the last 20 years, she's lost virtually none of the participants. They keep asking when we're going to interview them again." It's been five years since Reinherz last checked in with her kids, when they were 30, and she thinks it will be another five before she looks back in on them, even though she herself will be pushing 90. "I'd like to get them again when they're 40," she said. "They'll be starting to build families, careers will be well launched. "And I think their level of contentment will get better as they get older." For Reinherz, this is just a professional way of saying what she's always wanted for her kids. She just wants them to be happy. Hometown: Born in Malden, where she still lives. Education: A graduate of the Malden public schools, she got her bachelor's degree in English from Wheaton College in 1944, then went immediately to the Simmons College School of Social Work, where she earned a master's degree in 1946. In 1962, she earned a second master's degree from the Harvard School of Public Health, and finished her PhD there in 1965. Family: Husband, Sam, a WWII veteran who worked in real estate in his later years, passed away 17 years ago; son, Ellis, 57, is a professor at Harvard Medical School; grandson Jesse, 17, is a 6-foot-2, 220-pound high school football player; granddaughter Anna, 11, is a ballerina. Hobbies: "I love murder," says the mystery novel addict. "I've often said that when I give up doing research, I would write murders. But genteel murders."